Recently, at 23b, we've been hosting a DIY bicycle repair workshop called The Bike Cantina. Orange County has the best weather in the country, and with summertime in full swing, lots of people are out riding bikes. 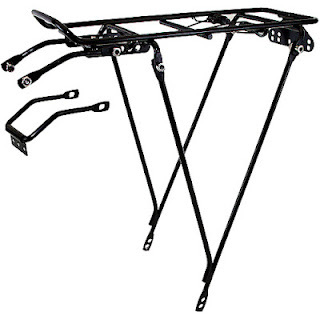 After visiting several retail bike stores within a few miles of here, I found very few options for cargo racks that looked durable, handsome, and inexpensive. The least sophisticated racks at Wal-mart are $15, and you pretty much get what you pay for. That's a shame. I'm sure it works fine, but why send another dime to China and Wal-Mart? With so many useful tools at the shop and a plethora of spare parts, our manufacturing capability is only limited by our imaginations and skills. At 23b, $30 of vastly overpriced (but still superior) domestic material, a trip to the stock bins, and an afternoon of mindful tinkering, can result in this one-of-a-kind, handbuilt, stainless steel, TIG welded cargo rack. Here's Tati assembling the panels for her panniers. In the scrap pile, we found some leftover fiberglass honeycomb sheets which have an amazing strength to weight ratio, high stiffness, and it's surprisingly easy to work with. Band sawed, a few holes drilled along the edges, then bound with zip ties, the crates stiched up nicely. The crates are now solidly mounted to the rack with an army of zip ties. Another useful iteration of this would allow us to quickly remove the crates, and then be able to quickly and firmly re-mount them to the rack. if you tie a light but sturdy hinging flapping top to both compartments you will essentially create another level of cargo and much wider as well!! Looking for a cheap wire basket for top mount? -- Check out wire-frame chafing dishes available through restaurant supplies (Gordon's in MI has one for less than $4, chrome plated). Good source for strong fiberglass panels: live near a body of water? -- portable recip-saw on junk boats.